The library at the University of Puerto Rico, Humacao. Héctor Rios Maury, chancellor of the University of Puerto Rico’s Humacao campus, speaks to staff and students after the storm. It’s dangerous to venture outside at night. An island-wide curfew was lifted last week, but without streetlights, stoplights or police, driving and walking are dangerous after dark. The aftermath of the Great Okeechobee Hurricane in Florida, 1928. This is a story that’s been a big dread of mine to write. Not because the issues are hard for me to understand; far from the contrary. I just didn’t want to watch the trailer for this movie. What movie am I talking about? 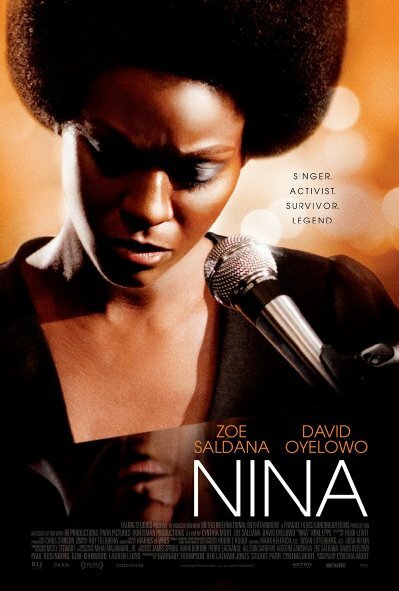 Nina, the beleaguered movie about Nina Simone starring Zoe Saldana and David Oyelowo. Nina made tons of folks mad a few years ago, when it was in production, and now it’s making folks mad again now that the film is coming to Digital HD and VOD April 22. First, let’s take a look at the poster and the trailer, and see if you can figure out what might be at fault here. And here are some actresses discussing their feelings about the film. If you’ll notice, every one of the actresses gives a huge sigh before answering the question, showing how difficult a position it is to take on a film like this that intersects the issues of diversity in film as well as colorism in Hollywood. We hear a lot about diversity as a whole, but one of the most open secrets in Hollywood along with a lack of diversity is a focus on colorism. What’s colorism? Let’s use the Racebending. com definition, since it’s the most succinct one I’ve found in a while. As the definition states, Hollywood is rife with colorism, particularly when it comes to African American and Latina roles. Colorism affects not only limits the types of roles certain women are given, but it also makes young women who watch film and television feel like their skin tone makes them ugly and a pariah of society. Evidence of this can be seen in Saldana’s acting career itself; more often than not, Saldana has played exoticized love interests, whether she’s in her own skin or not (such as her roles in Avatar and Guardians of the Galaxy). Even in a film role like the title role of Columbiana, her character is sexualized to an unnecessary degree. • The original casting call for Straight Outta Compton was laced with colorism, calling for “fine girls” who are “light-skinned”, while darker-skinned girls were “poor, not in good shape.” The “hottest of the hottest” girls had to have their real hair (the other girls could wear weave; the hair discrimination is yet another level that needs to be discussed at a later time), and could be “black, white, asian, hispanic, mid eastern, or mixed race too.” The unspoken thought was that only truly beautiful girls have their own hair and can be of any race, but, even with the mention of black women in the “hottest of the hottest” section, it’s still implied that to be especially beautiful as a black person, you have to be light-skinned. As stated above, Simone’s work was all about blackness, in particular exalting dark-skinned, Afrocentric beauty. None of this means that Saldana is somehow not “black enough”. But, what people are saying is that Saldana’s casting blocks other women of color who are better suited to the role, and the colorism at the root of that blockage is what Simone was fighting against with her art. The “Whites” Pickens could have been referring to are the team behind Nina, which is predominately white. Jezebel posted pictures of the crew, and while they didn’t put commentary with the photos, its implied that the crew didn’t know what pitfalls they were falling into because of a probable lack of awareness of black issues, or even the many different types of black beauty. I don’t think I need to explain this one with a long paragraph. The makeup, the accent, the story, and everything else about it just looks off, to say the absolute least about it. Just take a look at the poster and trailer again and compare it to actual video of Simone to see what I’m writing about. Okay, the film’s bad. But how much flack does Zoe Saldana deserve? There’s been some issue as to how much of the blame is on Saldana and how much of it is on the Hollywood filmmaking process itself. There’s two schools of thought; that the actress should know when and when not to take a role and that Hollywood has to remove itself from its Eurocentric way of thinking about race, color, and racial/ethnic representation as a whole. The debate is compounded with the fact that Saldana is Afro-Latina, and as a member of the African diaspora, many feel like she should be given the chance to play a black legend. As the actresses in the video stated above, Saldana is a fine actress. The critiques about the film aren’t directly about her as her own person, but how Hollywood has kept its colorism ceiling in check when it comes to which black actresses can play which character. But it’s hard to critique the film without some believing that Saldana’s blackness, and the blackness of all light-skinned black people, are in question. Blackness should never be in question. What is in question is the lack of responsibility involved when it came to making a film that properly represented Simone, her art, and her message, which revolved primarily around colorism and racism. Seeing Saldana in what is effectively blackface (or as Arie called it, “black(er) face”), goes slap in the face of Simone’s message. Even without the colorism angle, there should have been a responsibility to not make a film that would dull down Simone’s legacy to just a story based on the rumor of a romance between her and her manager, a rumor that’s been repeatedly refuted by Simone’s own people. Zoe has said that playing Nina Simone is her truth. Does she deserve any of this blame? I don’t know her and I don’t think she did anything wrong. If I were in her shoes and I admired Nina Simone the way that I hear she does, I would have said yes, too, and I don’t even think I can act. If they asked me to sing Nina Simone, I got that. But I never pursued it because I felt it was not my place. And I don’t know if it was her place to do that. What do you think of the Saldana-Simone movie controversy? Give your opinions in the comments section! Yesterday, tons of people gave their two cents on Chris Rock’s Oscars monologue. The monologue itself has been met with a range of emotions, from delight to disgust (you can read my opinion here). But it’s the jokes outside of the monologue that made people justifiably upset, especially since the jokes were a part of a night dedicated towards ending the diversity glass ceiling in Hollywood. Towards the end of the night, two tasteless jokes reared their ugly heads, and both made fun of Asians. First, Sacha Baron Cohen, as his poser character Ali G., crudely compared the Minions to Asian men by using the phrase “little yellow people” and invoking sexual stereotyping. Apparently, Baron Cohen was supposed to do his bit with Olivia Wilde straight, but he had his wife, actress Isla Fisher, sneak in his Ali G. costume. “The Oscars sat me down beforehand and said they didn’t want me to do anything out of order, they wanted me to actually just present it as myself,” he told ITV’s Good Morning Britain (as reported by the Guardian). “But luckily my wife put on the Ali G beard in the disabled toilets and I managed to get away with it.” In order to put the whole costume on while in the bathroom, they pretended Baron Cohen had food poisoning. According to what Baron Cohen said, Rock gave him “the thumbs up” to go ahead with the stunt after meeting with Rock to quickly pitch him his idea. Second, when Rock opened the part of the show usually dedicated to introducing the accountants from PriceWaterhouseCoopers, he introduced three Asian kids. While the kids were cute, the joke wasn’t. I think it’s unnecessarily limiting and I think it’s unfortunate that they can’t get out of that box for themselves because I’m not in that box…It’s not clear to me why people think that is. I don’t know if it’s because I’m black and they can’t see past who I am and understand that I’m multifaceted, or if it’s just easier for them to think in binary terms. But that’s not what #OscarsSoWhite is about at all. Race is just one portion of it; it’s all marginalized communities, and within race, it’s not just black people; it’s definitely about Asian people. It ‘s definitely about Latinos and Latinas and Hispanics. It’s about everyone who should be represented on the screen. What’s equally as sad is that Rock had proven himself to be the right guy to take on Hollywood for its transgressions, both in his career and, by several accounts, earlier that night in his monologue. Many actors, actresses, and even NBA star Jeremy Lin tweeted their disapproval and disappointment in the jokes. So far, there’s been no word from Rock or his camp re: his Asian jokes. As stated in the Oscars article Monday, if I was tasked with hosting the Oscars, I would have made sure to advocate for all minorities and oppressed people, because we’re all in this fight together. I wouldn’t have specifically only discussed the black acting pool, because the #OscarsSoWhite issue affects more than just the black acting pool. However, that’s how I’d do it. The question of if minorities should advocate for one another should be a resounding yes. The unspoken question, though, seems to be if Chris Rock should have been (at least on Oscar night) that particular minority activist who does advocate for others. As to what Rock feels about his own performance and how he should proceed in the future can be answered by Rock himself, but the disappointment the jabs at Asian stereotypes caused is something that will linger for a while and, hopefully (like all disappointment should) lead to increased action to make sure all people properly represented by the media (including jokes). What did you think about the off-putting jokes? Give your opinions in the comments section!